GRAPEVINE, Texas (CNS) — Quoting from Pope Francis’ apostolic exhortation “The Joy of the Gospel,” Archbishop Christophe Pierre encouraged Hispanic Catholic leaders and bishops to continue working toward being an evangelizing church by seeking an encounter with Christ and taking initiative while accompanying those on the peripheries. “The church which ‘goes forth’ is a community of missionary disciples who take the first step, who are involved and supportive, who bear fruit and rejoice,” Archbishop Pierre, apostolic nuncio to the United States, said Sept. 20, the opening day of the Fifth National Encuentro. Nearly 3,000 ministry leaders at the gathering in Grapevine were selected to represent 159 dioceses across the country. During the Sept. 20-23 event, participants were taking part in listening and dialogue sessions to discuss a wide range of issues they consider to be priorities in Hispanic Catholic ministry for the church in the United States. 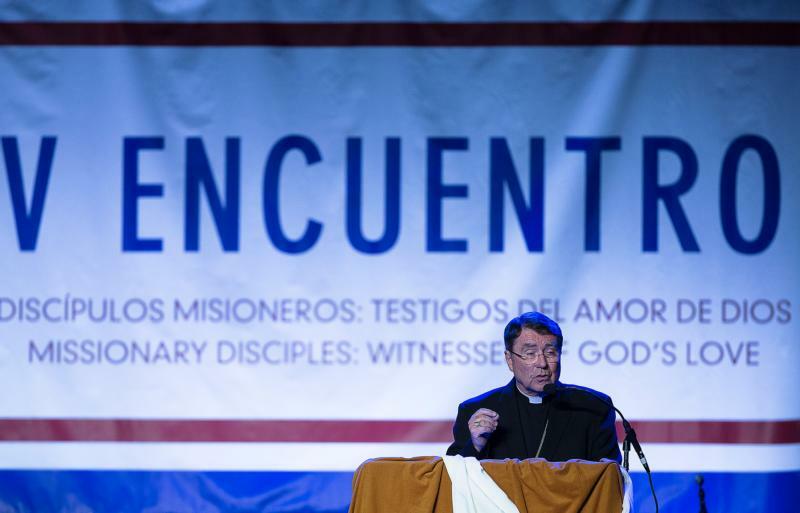 The Fifth National Encuentro, also called V Encuentro, is a process of missionary work, consultation, leadership development and community building that seeks to develop better ways in which the Catholic church can respond to Hispanic Catholics in parishes around the country. It also seeks to strengthen them as leaders and missionary disciples. As in previous encuentros, the goal is to develop a national pastoral plan for Hispanic ministry for the present and for years to come. Archbishop Pierre, in his keynote address, praised the work done by Encuentro leaders to reach those on the peripheries as they answer the call to be missionary disciples. In remarks delivered in both English and Spanish, the papal nuncio warned against judging and condemning the church and considering it distant. “We are the church, if there’s need for a conversion it starts with us,” he said. He also challenged the leaders to seek new ways to reach out to those who are indifferent and to those who have abandoned the church or are on existential and spiritual peripheries. “What leads to a change of heart in Christians is precisely a missionary spirit,” he said. The archbishop described the characteristics of an evangelizing church: getting involved, taking initiative, staying committed, accompanying others, bearing fruits and feeling joy. The nuncio also urged everyone to get involved and not just remain as spectators and invited bishops and clergy to keep their vocations alive. “Accompaniment entails guiding, encouraging and supporting, and uniting. The church that actively does this is a synodal church — a church that walks together. One speaks of synodality in the church and synodality of the church,” he added. He explained synodality “in” the church as a church that journeys together renewing the life and practice of faith through constant discernment and action involving many forms of participation and action. Synodality “of” the church, he said, refers to the journey of the church with humanity through history. He concluded by inviting others to live the joy of the Gospel.